Luxury Candles: Tealights, Pillars, and Tapered Smart Candles. Luxury Candles do what the best candles do: create a cosy environment. However, although they look great, look real, and are made of real wax or wax-like silicon, the flickering flame is artificial and electronic. Luxury Candles don't do what the best candles do: get stuck in the holder, drip hot wax on the tablecloth, look messy eventually, make sooty marks, give you smokey-eyes, present a danger to children and pets, burn down and go out, get blown out, cause a fire, and cost a lot. And the matches or lighters are a temptation to your kids. No more picking out old hard wax from holders, candelabras, and candlesticks, driping melted wax onto the holder, and trying to get the new candle to look straight and stay straight. For a photo preview of some of the candles, click the Cherry Heaven TV player above . 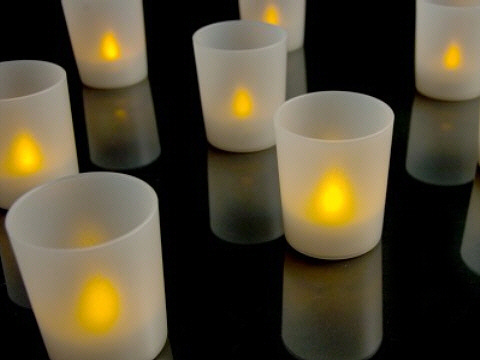 Smart Candles look like real candles and have a flame-shaped LED that flickers at random. The batteries can last as long as 250 hours because the candles are only on when you want them on. They're risk-free in a family environment at home, in a shop window, in a restaurant, at parties, at a wedding, or in the garden. The smallest smart candles are just like tealights in real frosted-glass holders. The real-wax candles are like normal pillar candles. 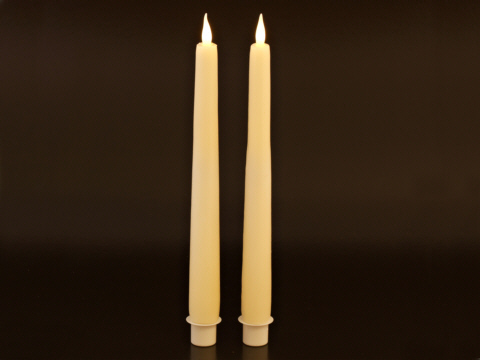 The silicon candles are like tall tapered candles that fit in candelabras and candle sticks. They use CR2032 3V lithium batteries, or AAA 1.5V alkaline batteries. You can buy these batteries in the on-line shop. Smart Candles: Party Light Candle. Smart Candles: Small Pillar Candle. Smart Candles: Medium Pillar Candle. Smart Candles: Large Pillar Candle. Smart Candles: Tall Tapered Candle. 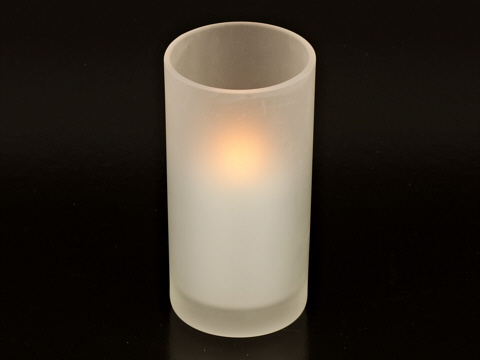 The PartyLight Candle is an electronic tea-light module in a frosted glass-look holder, measuring 55mm x 65mm. The LED flame flickers realistically and the CR2032 battery lasts for at least 40 hours: for three hours a night, that's nearly two weeks of cosy glow. As you can see in the photo, they look great in a cluster. It doesn't get hot, so it's safe to use near children, by your bed, on christmas trees, next to curtains, in a bathroom, and with table decorations. It won't mark a polished surface, it won't drip wax on the carpet or the tablecloth, and it won't matter if you go to sleep with it still on. It's ideal for parties or special occasions, indoor and outdoor, as it won't burn anyone, set fire to anything, or shatter if it gets knocked over. The switch is in the bottom of the integral tealight module. The Smart Candle comes with a CR2032 3V lithium battery that lasts for at least 40 hours. You can buy spare batteries in the on-line shop. Having spare CR2032 batteries at home is a good idea as they're commonly used in watches, cameras, calculators, card-torches, computers, digital weighing scales, torches, hand-held games, key fobs, mini fm radios, mp3 players, and toys. The PartyLight is meant to be durable and safe. Although the holder looks like frosted glass, it's a plastic moulding, so it won't shatter when the inevitble party-accident happens. 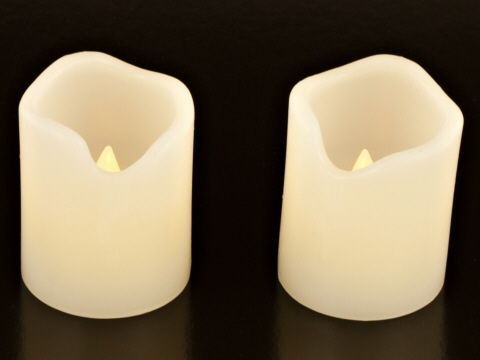 The TeaLight Candle is a small electronic tea-light module in a real frosted-glass holder, measuring 55mm x 65mm. The LED flame flickers realistically and the CR2032 battery will last for at least 40 hours: for three hours a night, that's nearly two weeks of cosy glow. They look great in a cluster. It's ideal for parties or special occasions, indoor and outdoor, as it won't burn anyone, set fire to anything, or shatter if it gets knocked over. The switch is in the bottom of the separate tealight module. 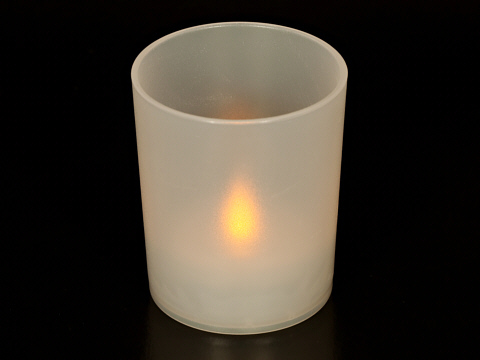 The CosyLight Candle is a 63mm high electronic candle module in a real frosted-glass holder, measuring 61mm x 122mm. The LED flame flickers realistically and the two AAA batteries last for up to 250 hours: for three hours a night, that's nearly twelve weeks of cosy glow. They look great in a cluster. It's ideal for parties or special occasions, indoor and outdoor, as it won't burn anyone, set fire to anything, or shatter if it gets knocked over. The switch is in the bottom of the separate candle module. The Smart Candle comes with two AAA 1.5V carbon-zinc batteries that will last for up to 70 hours. You can buy spare Duracell alkaline batteries which will last for up to 250 hours in the on-line shop, but don't mix carbon-zinc and alkaline or old and new. Having spare AAA batteries at home is a good idea as they're commonly used in watches, cameras, calculators, card-torches, computers, digital weighing scales, torches, hand-held games, key fobs, mini fm radios, mp3 players, and toys. 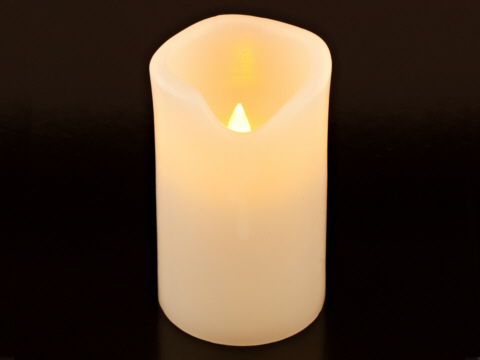 The Small Pillar Candle is an electronic tea-light module embedded in a real-wax candle, measuring 48mm x 63mm. The LED flame flickers realistically and the CR2032 battery lasts for at least 40 hours: for three hours a night, that's nearly two weeks of cosy glow. They look great in a cluster. It's ideal for parties or special occasions, indoor and outdoor, as it won't burn anyone, set fire to anything, or spill hot wax if it gets knocked over. The switch is in the bottom of the embedded tealight module. The Medium Pillar Candle is an electronic candle module embedded in a real-wax candle, measuring 76mm x 128mm. The LED flame flickers realistically and the two AA batteries last for up to 250 hours: for three hours a night, that's nearly twelve weeks of cosy glow. They look great in a cluster. It's ideal for parties or special occasions, indoor and outdoor, as it won't burn anyone, set fire to anything, or spill hot wax if it gets knocked over. The switch is in the bottom of the embedded candle module. Spare AAA batteries will always be useful as they're commonly used in cameras, calculators, torches, hand-held games, small radios, mp3 players, and toys. The Large Pillar Candle is an electronic candle module embedded in a real-wax candle, measuring 76mm x 174mm. The LED flame flickers realistically and the two AA batteries last for up to 250 hours: for three hours a night, that's nearly twelve weeks of cosy glow. They look great in a cluster. 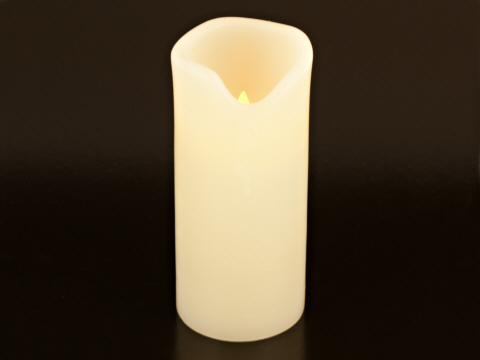 The Tall Tapered Candle is an electronic candle module embedded in a real-wax candle, measuring 25mm x 240mm. The LED flame flickers realistically and the AA battery lasts for up to 70 hours: for three hours a night, that's over three weeks of cosy glow. They look great in a candelabre or a standard candle holder. It comes with a small end cap so that it fits snuggly into a candelabra or candlestick: so no more picking out old wax and trying to get the candle to stay put. It's ideal for parties or special occasions, indoor and outdoor, as it won't burn anyone, set fire to anything, or spill hot wax if it gets knocked over. The switch is the flame: just press it. The Smart Candle comes with one AAA 1.5V alkaline battery that will last for up to 70 hours. You can buy spare Duracell alkaline batteries which will last for up to 250 hours in the on-line shop, but don't mix carbon-zinc and alkaline or old and new. If you don't believe in Candle Magic, it's still interesting to learn about the idea, especially as it generally gets a negative reception due to years of misunderstanding and connection with superstitions, religions, black witchcraft, and devil worship. In fact, Candle Magic is simply an ancient skill which can be used to influence events. In some ways, you've probably already used Candle Magic at significant events. For example: birthdays, special dinners, romantic bedtimes, relaxing bathtimes, cosy evenings, and departure. Anyone can use Candle Magic. In essence, it's very simple: find a still dark room, look at a burning candle, focus on what you want, concentrate on a symbol which represents your desire, and begin the process of attracting your wish to you. Many people use Candle Magic to achieve financial stability, secure a fulfilling relationship, love and heal themselves and others, and find and understand their life-paths. The pressures and stresses of modern life can make it difficult to slow down our conscious-mind activity. And, because our conscious mind holds on to years of pre-conceived ideas and conditioning about ourselves, our relationships, and our environment, we effectively stop ourselves from achieving our goals. If you find it difficult to concentrate on anything but your immediate problems and needs, Candle Magic might help you to set aside your conscious concerns and allow your sub-conscious to enable those things you wish for. Thoughts can lead to ideas, then actions, then events. Your emotional state, experiences, interaction, and belief system, are important factors in how you interpret your thoughts and the actions of others. Remember that thoughts often lead to events. If you apply your thoughts negatively to harm others, you might enable negative events: and, strangely, these will return and come knocking at your door. Smart Candles come with a CR2032 3V lithium battery or one or two AAA 1.5V alkaline batteries. They'll last for between 40 and 250 hours. You can buy spare batteries in the on-line shop. Having spare CR2032 and AAA batteries at home is a good idea as they're commonly used in watches, cameras, calculators, card-torches, computers, digital weighing scales, torches, hand-held games, key fobs, mini fm radios, mp3 players, and toys. If the candle is in a holder, make sure the holder bottom is thick enough to stop heat damaging the surface it's standing on. Small holders will be hot if you pick them up. The first few times you use a large pillar candle, burn it for about an hour for every 25mm of its diameter. The pool of wax will reset, and you'll avoid getting a hollow candle. Candles need a bit of space, so a large candle in a small room might flicker and smoke. Don't blow the flame out: you might blow small drops of hot wax onto something or someone: use a candle snuffer or a teaspoon. If you like to move your candles, make sure the holders will catch any drips of hot wax. Cheap candles have additives added to the wax, so usually smell disagreeable, irritate your eyes, burn unevenly, smoke more, and stain any fabric the wax drips on. Good quality candles shouldn't smoke, although scented candles might smoke a little. A long wick can make the candle smoke, so keep the wick trimmed to about 6mm. If you drop hot wax on your clothes, put the item in the freezer for ten minutes, pick off as much wax as you can, lay a few sheets of plain kitchen tissue over the remainder, and iron it carefully at a temperature appropriate for the fabric: not with the steam setting on. If you drop hot wax on upholstery or a carpet, put a small plastic bag of ice on the wax for ten minutes, then repeat most of the advice above. Candles are enjoyable, calming, and fragrant, but don't forget that you're dealing with fire. Always take precautions to prevent your enjoyable experience from turning into a disaster. Candles with leaves, or other decorations, embedded in the wax, may unexpectedly flare up. Candles in the garden need a protected flame. Finally, if there's a power cut, use a torch to find your way around the house: not a candle.